Fig. 1. 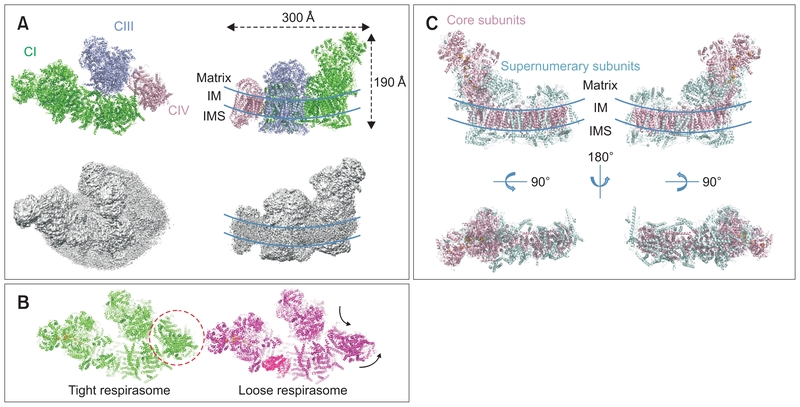 Cryo-electron microscopy (EM) structure of mammalian supercomplex (SC) I1III2IV1 and CI. (A) The Cryo-EM structure of the porcine SC I1III2IV1 (upper row, PDB code 5GUP) and the EM density map (bottom row, EMD-9539) (). The map corresponding to porcine SC was generated from the 4.0 Å map at a contour level of 0.0412 using the UCSF chimera (). Top views are from the matrix (left) and side views along the membrane (right). CI, CIII, and CIV are colored in green, light blue, and light pink, respectively. The transmembrane region is indicated by two curved lines. IM, inner membrane; IMS, intermembrane space; CI, complex I; CIII, complex III; CIV, complex IV. (B) Cartoon representation of tight (left, PDB code 5J4Z) and loose SC (right, PDB code 5J7Y) from ovine samples are shown viewed from the top view (). CIV is shown in the red dashed circle. (C) Cartoon representation of the 3.9 Å resolution structure of the ovine CI (PDB code 5LNK). The core and extra subunits are colored (). The 14 core-subunits and 31 supernumerary subunits are colored in light magenta and cyan, respectively.